Well since we're talking about clear lenses and stuff. 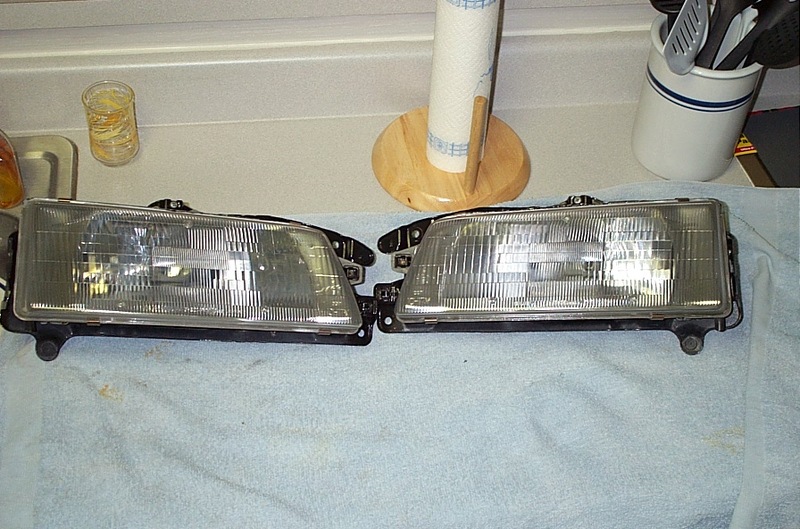 I just got done cleaning a set of used headlights. I'm going to do the same procedure on my old ones that are yellow and nasty. Here are some pics, and then I'll tell you how I did it. It's pretty involved. Pics are so-so....I'll try to get pics of them on the car. A guy at a body shop told me about this. If I sand the lenses down and clear coat them, it would protect them from yellowing. He said I'd probably have to do it every so often....but I don't think he thought I'd go to the steps I did to remove the existing yellow. I'm going to explain everything and then throw in the optional step. You basically start with the 320 sand paper or 400, depending on how oxidized the lights are. Do this wet.....so the sand paper doesn't completely chew up the lenses. I did mine in my sink...hahaha. Sand things down and smooth as you can with that grit, and then move to the next highest grit. Like I said, I did this using water for all grits. Once I was satisfied with things I then cleaned them up, and prepped them to be clear coated. I was talking to my body shop guy and I was asking about what causes "orange peel" in paint, because I got a decent batch of it on the one light. I re-did it. What he said was it is caused by drying time, and how well the paint flows. So with that in mind, I would think that the paint would dry slower in colder weather, and therefore would have less chance to orange peel. I did one light coat, and then a heavy one. The clear coat seemed to be sucked up and looked better the longer I let it set. Now for the optional part. Some point along my work, I ended up using acetone on one of the lenses.....well acetone is a solvant and it sorta ate the plastic.......but what it was eating was the yellow oxidation......so I kept using it until I got no more yellow on the paper towel. The only problem is that it leaves a nasty mess on the lense, and you need to really work at sanding and getting rid of it. Which was why I went with 320 grit sand paper. It is definitely more work to use the acetone, but the results and chances of yellowing are probably slimmer. When I get around to doing my other lights, I'll do a before and after pic. Last edited by Legacy777 on Mon Oct 06, 2003 1:42 pm, edited 1 time in total. Looks good Josh! I may look into cleaning mine up a bit this weekend. Now what I have to figure out for next winter is how to prevent snow and junk accumulating on the lenses. Its a pain in the arse to have to clean them off before I go driving. My question is, at what point does the spatula come in? j/k, Nice job, I'll have to give it a shot, too. You leave the spatula out of this.....he didn't do anything to hurt you.....LOL. I think I found it at NASIOC forums. Went from 200-400-800-1500 grit sandpaper with the last one wet. Then I got some chrome/metal polish (Blue Magic I think), and gave them the twice over (this is supposed to leave a silicon coating, and I can attest that they are very smooth and click now). VERY good result. 100% crystal clear lights. Much brighter and very good looking from the front now... all that yellow crap is gone. I had excellent results w/ Mother's mag & aluminum wheel polish. Mother's Mag and Aluminum Polish did get rid of a lot of my yellowing, but not all of it. 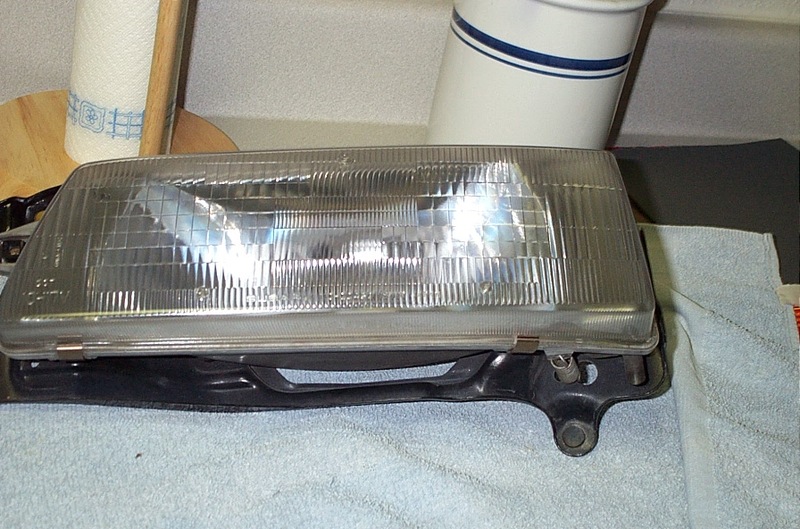 If I didn't have a like-new headlight to compare it to, I might have believed that it got rid of all of it. But I think the only way to actually get fully clear headlights is either what Josh has described, or buying new lenses altogether. I wonder if the clear coat will actually keep the plastic from re-yellowing. The pictures don't seem to be working for me. I tried some of the Mother's Mag polish. It didn't do a whole lot. I'm going to try the sandpaper and then polish if I ever get the time. It's been almost 2 months now, and zero yellowing. Josh - Well, I think the yellowing happens more on the scale of years than months... But I don't know the cause. UV radiation maybe? Maybe the clear coat will protect against that. The reason they yellow is because the plastic is actually breaking down under contaminants, ozone, sun, etc, etc. Over time, once they reach a certain point, they will continue to yellow, and usually yellow worse as time goes on. The clear coat helps seal the plastic up so they don't yellow. What did you use for the clear coat???? Just the spray can duplicolor clear coat you can find in your local autoparts store. For the best application of the clear coat and to minimize "orange peel" the cooler the temps the better. What seemed to work best was one lighter coat, and then a much heavier coat. I ended up repainting the one light, because I didn't like how it turned out. that "Silicon coating" you guys refer to that's in the polishes you're using aren't going to do you anygood. Silicon will break down and deteriorate, bring your yellow back. Had i not found myself a new set of lights, i would follow the procedures 777 has done and put an actual --clear coat-- on the lights. This will last a lot longer. On further step would be to get some of those 3m protective shields for your headlamps to protect them from further impact, road debris, etc. Can you tell wich one was sanded and clear-coated ? it did the same thing when i used it on another thing one year ago... "Garbage it will go"
'98 4Runner V6 Manual 4x4. Yeah I had some bad orange peel on mine. Had to redo it. The left turned out better then the right, but you have to get closer to see. I found that a light coat, and then a heavy coat ontop of that seemed to produce the same results. Also, I talked to a body shop and the cooler the temps the better as it gives the clear coat more time to "flow" and flatten out. But yes....some better clear coat will help. - Put in the fridge for abount 10 min to cool the part down. - Put a nice clear-coat, enough clear so it's nice and smooth, not orange-peel-like . - Put it back in the fridg for 5min, then left them dry 15min on the shelf. - Another nice coat of clear, 5min fridg, and 30min drying, then put back on the car. Didn't think about the fridge. You inspired me ... "He sais it has to be cold.... hummm.... what is cold.... humm.... Fridge !!" 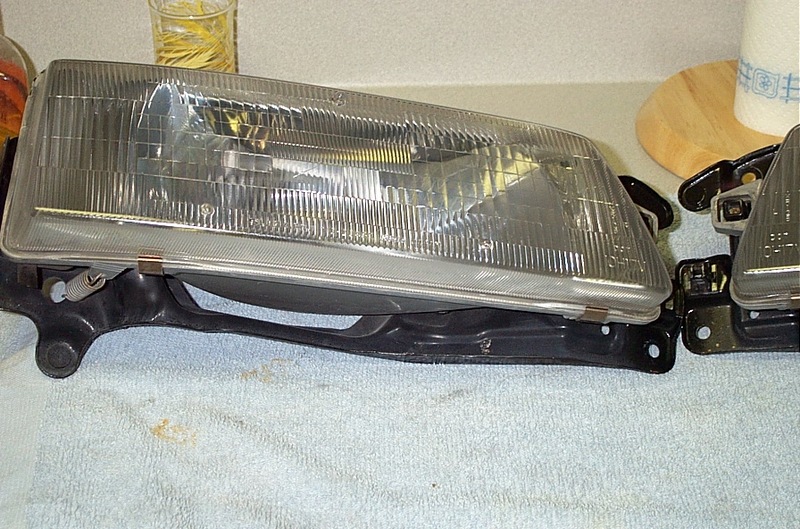 Ok dumb question but wont dry sand paper scrach your headlight horrably??? or is that only happen when you do it by hand?? We are looking at a 87 4WD GL Turbo for $750 as ours "toy"
yes it will scratch it lightly...you need to use very fine grit. You really should use water all the time, unless you have some very bad oxidation.